Create your own glamorous birdcage veil or fun accessory with a yard of this stunning material! This high quality fabric is made from 100% nylon it is available in a convenient 9 inch width, is finished along both edges for easy assembly, and provides enough stretch and give for any sewing project. Other uses for this netting include decorative accents on chairs, pews and tablescapes at a wedding or special event. Use it to add a bit of drama and interest to a floral arrangement or as pretty gift wrap bows. Authentic period costumes and hats can also be made using this versatile fabric. NEED MORE YARDAGE? Please contact me to order additional yardage. Very nice fabric in a very nice package, thank you very much! 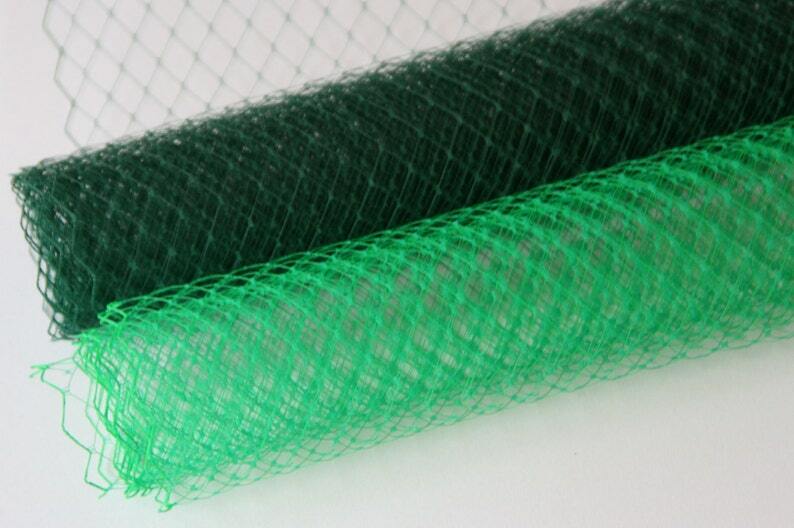 This netting is so lovely. It was the perfect finishing touch to a 1960s hat. We do our very best to represent our products accurately on our site. If you receive a product that does not meet your needs, please feel free to contact me immediately and we will do our very best remedy the situation. All sales are final! We do not accept returns for items that are shipped as promised. In rare cases returns can be accepted for store credit or exchange with PRE-APPROVAL from LushLapel. SHIPPING COSTS ARE NEVER REFUNDABLE under any circumstances. Item must be returned unused and in the same condition it arrived to you. Please contact me within one week (7 days) of receiving the item if this rare situation should occur. Each item is inspected rigorously for quality before being made available for sale. As many of our items are vintage or handmade, products may vary slightly from the picture due to variance in color, size of feathers, etc. WHEN WILL IT SHIP? Standard shipping will take place WEEKLY on FRIDAY. Although sometimes I sneak out an early package here and there, we guarantee posting of 'Ready to Post' items each Friday. Items requiring custom attention or dying may add additional time. If you need a special post office trip for a 'rush order' please purchase a rush shipping "add on" and convo me to arrange special accommodations. We will do our very best to accommodate you! TIMING: We cannot be responsible for ship times for packages traveling via first class mail, or those voyaging to another country. PRICING: Sometimes the Etsy widgets do not discount shipping enough for orders of several items. If that's the case, please contact me and I'll refund any flagrant overage.